From Bootham Crescent (football ground) to Bootham Park, very close by. I’ve been wanting to write an update on this for some time, and as the council has recently announced it would like residents’ views on the future of the site, now seems like a good time. After publishing the previous piece on the Bootham Crescent football ground I received by email this aerial view of the area, including both Bootham Crescent and Bootham Park. It dates from around 1909. The Bootham Crescent football ground, then a cricket ground, is towards the bottom right, marked ‘B’. The line of the old ‘Asylum Lane‘ (now Grosvenor Road and Bridge Lane) is a distinct line running through the centre of the image from right to left. The footbridge on it — crossing the York-Scarborough railway line — is marked ‘A’. The large open area on the bottom left is now the site of the city’s main hospital. 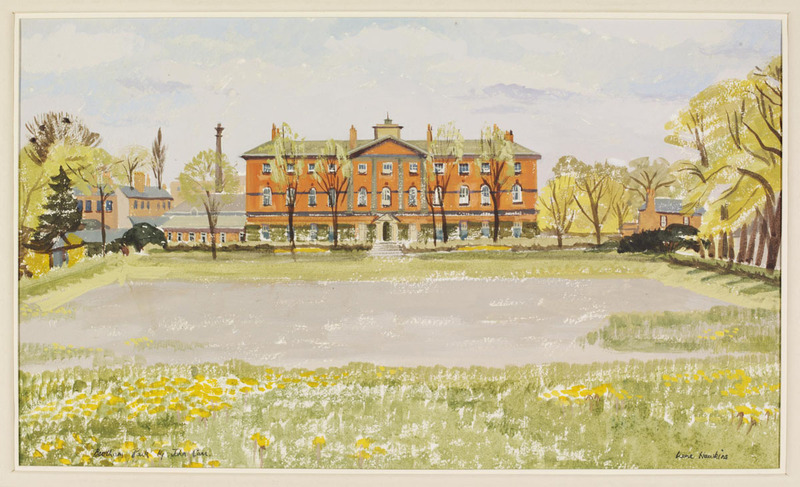 Bootham Park Hospital buildings are just above the ‘A’, and its extensive grounds, towards the top of the image, are marked ‘C’. The photo looks like it was taken during one of the galas held on Bootham Park, presumably by someone enjoying one of the balloon rides from there. Here’s another view of Bootham Park at gala time, looking towards the hospital building, across the grounds. Between the Hospital and the street are the Hospital grounds, consisting largely of meadow land. For a period of about sixty years commencing in 1859 these grounds were the scene of York’s greatest public holiday since the times of the mediæval Corpus Christi pageants—the Grand Yorkshire Gala. Beginning as a flower show (a feature which continued throughout its history) it speedily developed into a three days’ festival with “all the fun of the fair”, balloon ascents, and nightly firework displays. Railway excursions brought multitudes of visitors to York at Gala time, and tens of thousands of visitors passed the entrance turnstiles daily. Bootham Park, as the grounds are now called, was always spoken of in those days as “The Gala Field” — and is yet, by many of us. ‘And is yet, by many of us’, he wrote, in the 1950s. Perhaps not now. I’ve not heard anyone refer to it in this way. Some other older texts also refer to what we now call Bootham Park as ‘Bootham Field’, or ‘the Asylum Field’. Whatever we call it, I hope we’ll all be pleased that the sale of the site has been paused while other options are explored. It was bad enough that the hospital closed, then worse to see that the site might be sold off with no thought about its importance to the city and its residents. I wrote a lot about Bootham Park (approaches 1, 2 and 3) after the closure. I’ve lived close to Bootham Park for 27 years, and in recent years in particular have cycled and walked through it many times. For me my main interest is the grounds, the open space, and public access to it. After the hospital closure, I was concerned about (annoyed by) a security firm’s signs on the boundary, and being asked to leave the open space while walking around its perimeter. That was then. Now, there are some interesting ideas in the recent council proposals regarding the site’s future, and how it might link in with areas of land alongside it. The site has very definite boundaries on three sides: the main road of Bootham to the front of the site, the York-Scarborough railway line down one side, and Bridge Lane on the other side of the boundary wall to the back, with the main general hospital on the adjoining site there. But on the remaining side, to the east, there’s more scope for change, and it’s interesting to see the ideas for that in the proposals from the council. Part of that side of the site adjoins the Union Terrace car and coach park on Clarence Street, which is council-owned land. Ideas include opening up more cycle and pedestrian access from there. 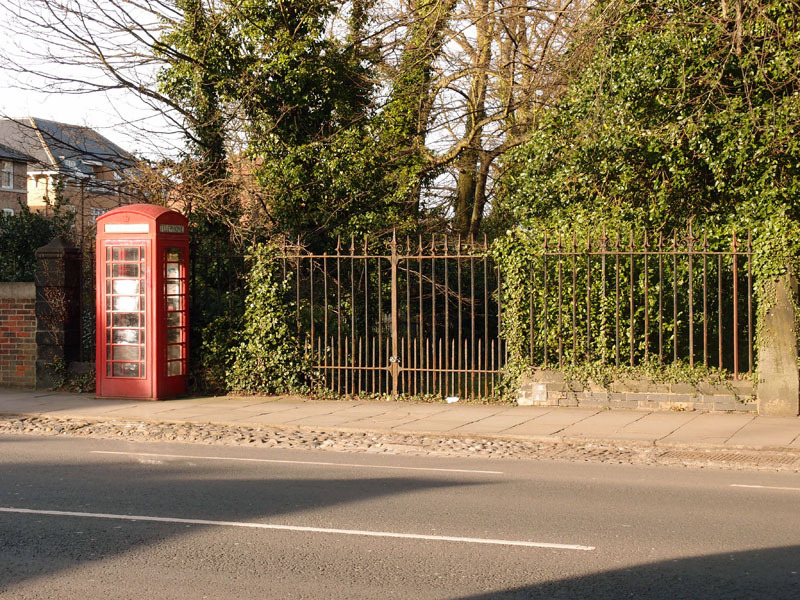 The ideas also include the possibility of opening up the long-closed rusty gates at one end of the Bootham boundary, mentioned on an earlier page. That would be nice. They look like they haven’t been opened since the days of the galas. More recently closed are the main access gates at the other end of the Bootham frontage, the double gates onto the access road. When I’ve been past and through the site recently only a narrow side gate is open, for pedestrians and cyclists, which is a bit annoying and inconvenient. Perhaps those gates could be opened up again without us all waiting for the results of the consultation on the various ideas. The field is generally now seen as ‘underused’ — a term which often makes me a bit nervous, as it’s often used about places that aren’t making money for someone, places that only local folks appreciate, and wander across for free. The council proposals hint at making more use of the grounds, to generate income. Or how about a modern re-imagining of an event held here in 1866? Another view of the same building must have been taken from the top of Grosvenor Terrace, before the tall trees grew on the boundary alongside the railway line. The railing and brick piers at the bottom of the photo are still there by the edge of the railway line, though so many other things have changed. No balloons taking off from here now, but part of the land in front of the hospital is often used by a more modern form of aerial transport. 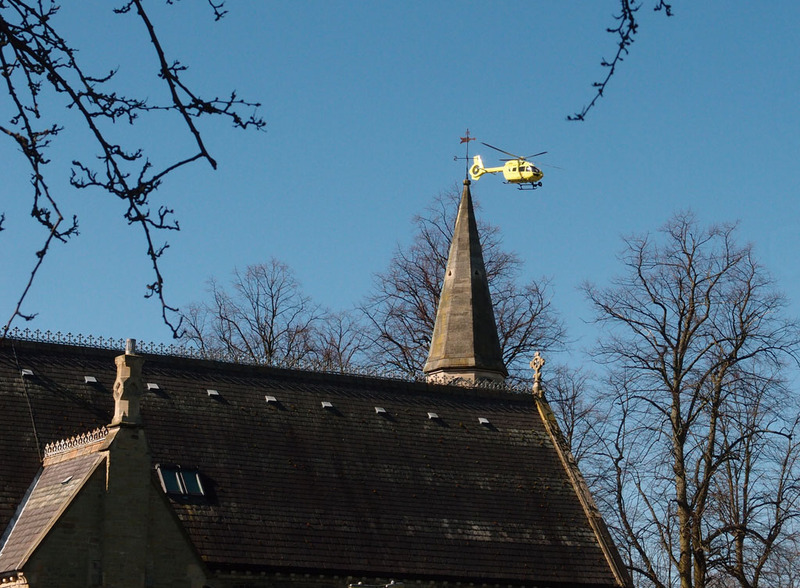 The air ambulance often uses Bootham Park to land. I’ve seen it many times from the local area, on its approach, but only this year saw it on the ground in Bootham Park, as I happened to be walking through, and watched it take off. As well as the large field in front of the hospital there’s green space to the side of it, around the chapel pictured above, and also the area where the nurses’ accommodation used to be. I suspect that some of this green space will be built on, and perhaps gated off. I think it might need another page at least to try to cover other parts and other aspects of the site, in light of what I’ve just read of the proposals for its future, and after completing the online survey. But for now, I hope this page has been of interest. Further links are below. Before you leave here and perhaps follow them, I just have to fit in my regular reminder of how to sustain this much-loved community resource. Virtual coffees are always appreciated, thank you. Proposals for the future of the site: see the city council’s page about the Bootham Park site. Comments need to be made by 9.00am on Thursday 1 November. More on Irene Hawkins’ painting, pictured at the top of the page. Worth a read. Information on the Bootham Park archaeological dig in 2011, from the University of York, Department of Archaeology, and a YouTube clip of it on this link (should start at the relevant point, 14:48). A proper exploration of place, one of the most inspiring things I’ve seen. There was also an exhibition. I missed the dig and the exhibition, but wrote about the project in ‘It’s all connected’. Homeless heritage mapped‘, in 2012, after watching the video. See also a nice article on it from Stephen Lewis (York Press). 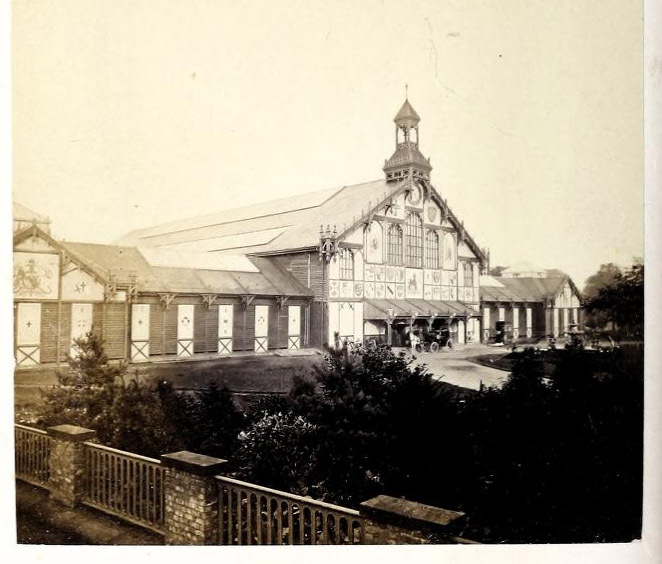 The history of the Yorkshire Fine Art & Industrial Exhibition, York – official publication on the 1866 exhibition on Bootham Field, published in 1867 – available to read or download from the Internet Archive. 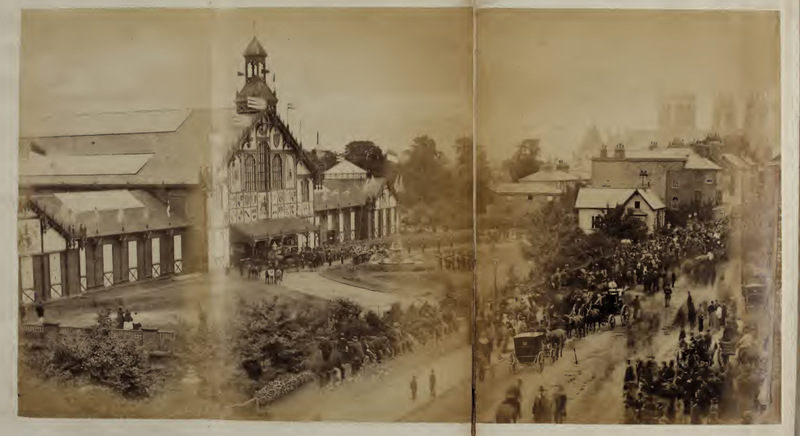 Some of the images above of the exhibition buildings come from this publication. 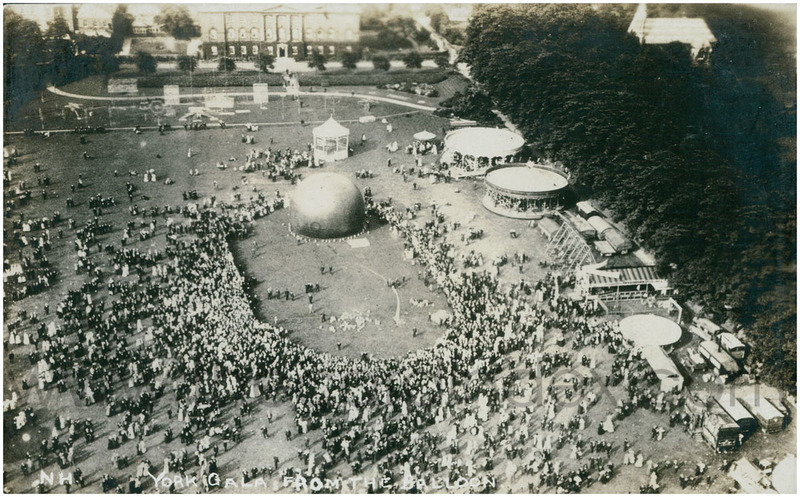 There are many lovely postcard images of the galas held on Bootham Field on cardindex.com. This link should take you to them. I’ve compiled many pages about Bootham Park over the years. This link will take you to all pages tagged Bootham Park. In 1988, when he worked with the York Oral History Project, my husband took part as photographer in a recreation of one of the galas on Bootham Park. It took place that summer and was called the Edwardian Fair. It was a big event, with lots of people in period dress and a lovely carousel. Unfortunately we haven’t got any photos as he was taking pictures for other people; developing them in sepia and sending them out afterwards. Does anyone else remember this fair? I think it only took place the once. 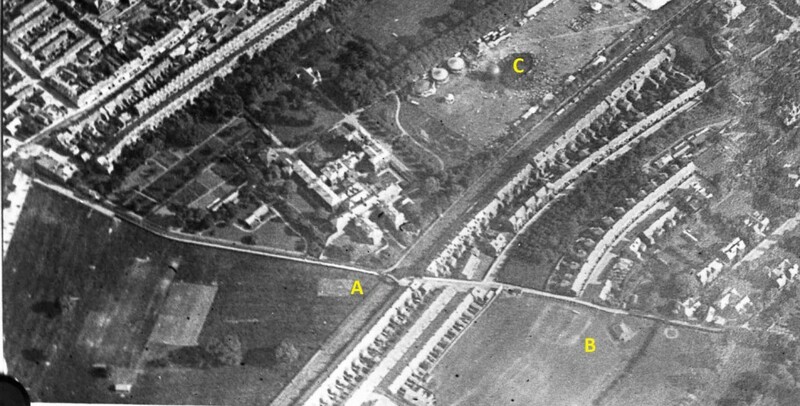 On the arial photo of the Bootham park area, the site of the later football ground, marked B, seems to have the faint markings of previous buildings or constructions. Does anyone have any idea what they were? I have heard that that site was considered as one of the possible sites the Roman arena or amphitheatre… tho those markings don’t look like an arena! And personally I am in favour of the Kings Manor/ Philosophical society area for that… But no chance of any excavations in either of those areas now, unless football suddenly goes out of favour.